If you - like me - are into hiking, the Bay Area and Northern California have a lot to offer. At least once a week, I crave spending time outdoors surrounded by nature (have you ever come across the Japanese tradition of "forest bathing"?). I find it uplifting and de-stressing. Nature is beautiful and inspiring and the perfect backdrop for a tea session, don’t you think? I’m incredibly lucky to live so close to scenic coastal trails, forests of towering redwoods, hills and farmland, waterfalls and mountains. This time I’m taking you hiking along the California coast, to Año Nuevo State Park, near Pescadero, about an hour drive from San Francisco. Año Nuevo State Park is famous for its colony of elephant seals and it’s amazing to see them in the wild. Inspired by my friends at Tap Twice Tea and their outdoors tea sessions while hiking (you should definitely check out their Instagram feed), I decided to give tea and hiking a try. I guess I had never done it before because I thought that the logistics of taking tea on a hike would be complicated. I was right … but that shouldn’t discourage you from trying or me from trying again! If you were camping, you would have a camping stove to boil water, but hiking is a different story altogether. First, you need a backpack, which I carry anyway on every hike for water, sunscreen, snacks, bug repellent, and so on. Not a big deal. 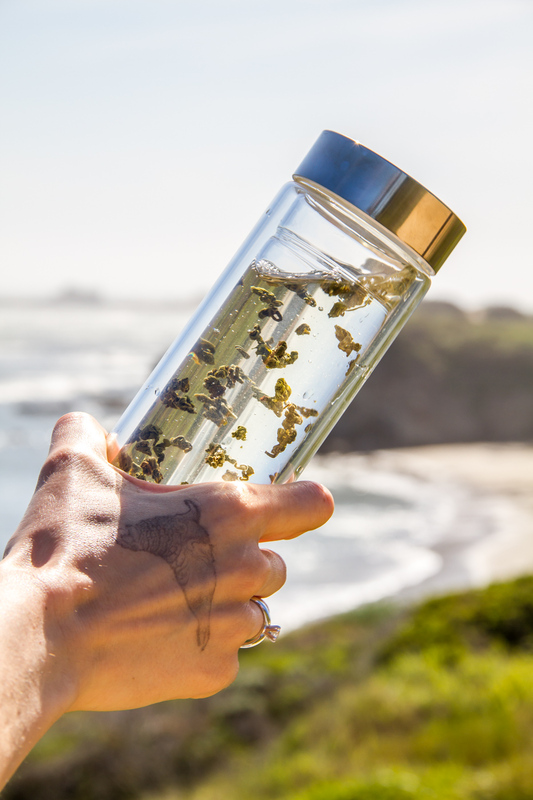 For some reason I was hoping that my double walled glass tea tumbler would keep my hot water at the right temperature long enough to steep my tea while hiking (which I had pre-measured and packed separately in a little container). By the time I got to the park (an hour or so drive from my home), my water was already lukewarm. What was I thinking? Tea and hiking. A park docent gave me this elephant seal stamp on my hand. Isn't it adorable? What can I do next time so that I can drink an excellent cup of tea on my hike? I will definitely store my hot water in a better insulated bottle (thermos / vacuum flask). I will have a limited amount of water for re-steeping but that’s still better than nothing, right? In my tea tumbler, Nepali Green Pearls by Young Mountain Tea, brewing in lukewarm water. I’d try steeping tea in my tumbler again (with or without infuser basket) and I’d bring small tea cups (if sharing tea with others). The next level would be taking the whole tea ware (gaiwan, cups, fairness pitcher, tray, tea towel) but I’d be a little concerned that my tea ware could break or shatter in the process. And how do you keep the hot water coming? How do you store your wet tea ware on the way back? If you guys have had any experience with tea and hiking, I’d like to hear you tips, tricks and hacks. Leave them in the comments down below, I can't wait to try them out! I want to chill on the beach like these elephant seals... with a cup of tea in my hand!